The kids love these muffins. 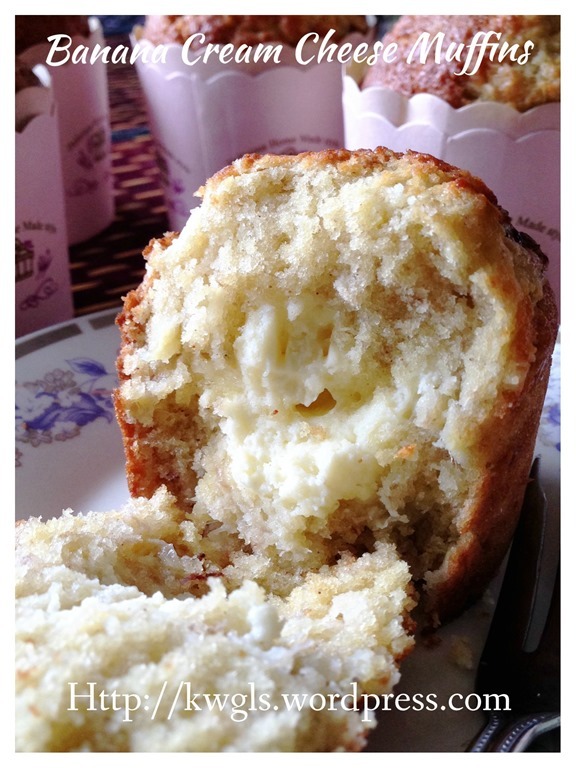 The reason is simple because there is a scoop of sweeten cream cheese inside the muffins. 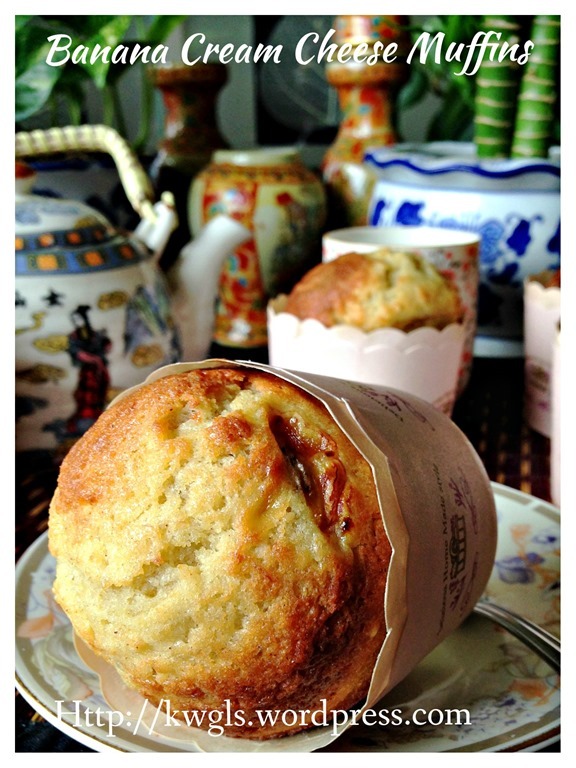 In fact banana is a good moisture retainer and cream cheese provide a smoothen effect for the muffins. 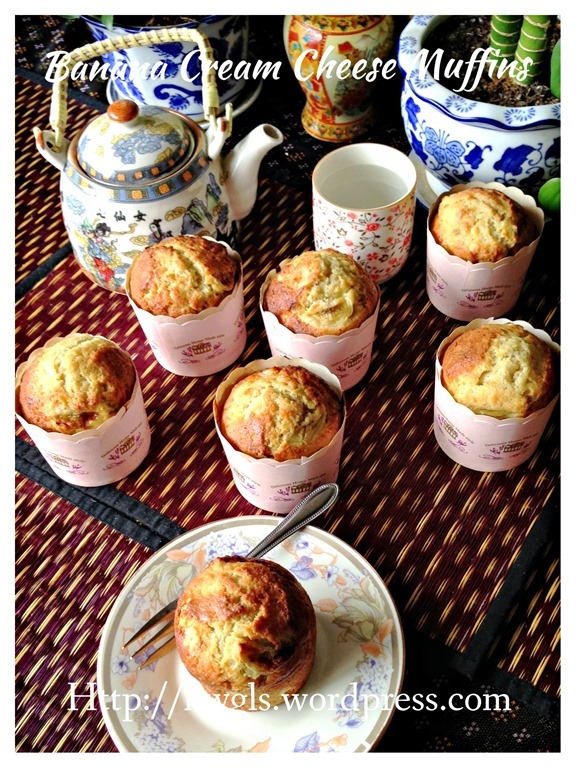 Some readers are asking me why my muffins rose beautifully. I believed that muffins should look like volcanoes. It shouldn’t be flat top like a cupcake because of its different way of preparation. Muffins are theoretically uses less fats, simple mixing, more compact and leavened (raised) by eggs, baking powder or baking soda. 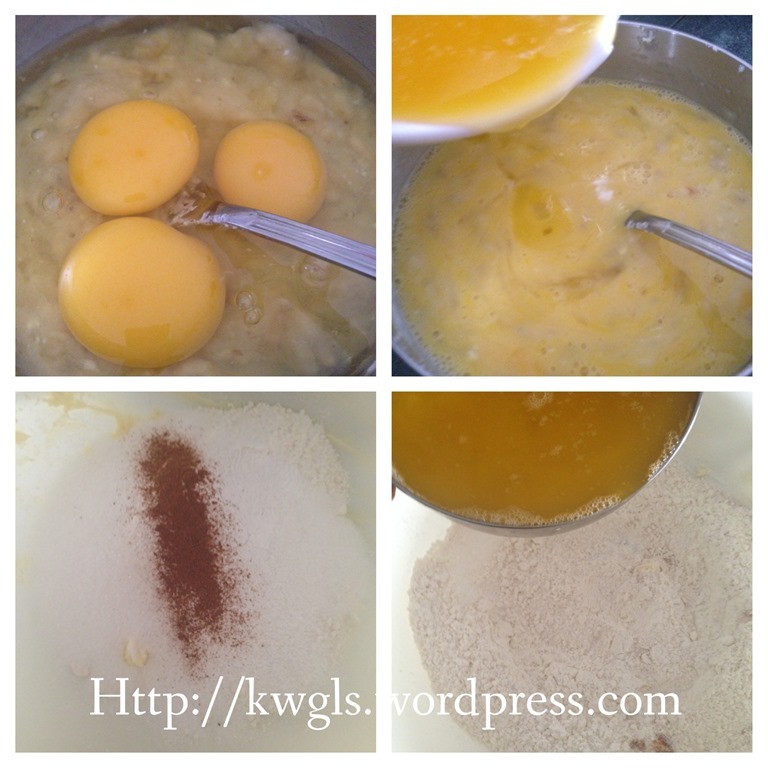 Egg in itself is a raising agent and besides eggs, baking powder and baking soda is of critical importance to assist in making the muffins fluffy. 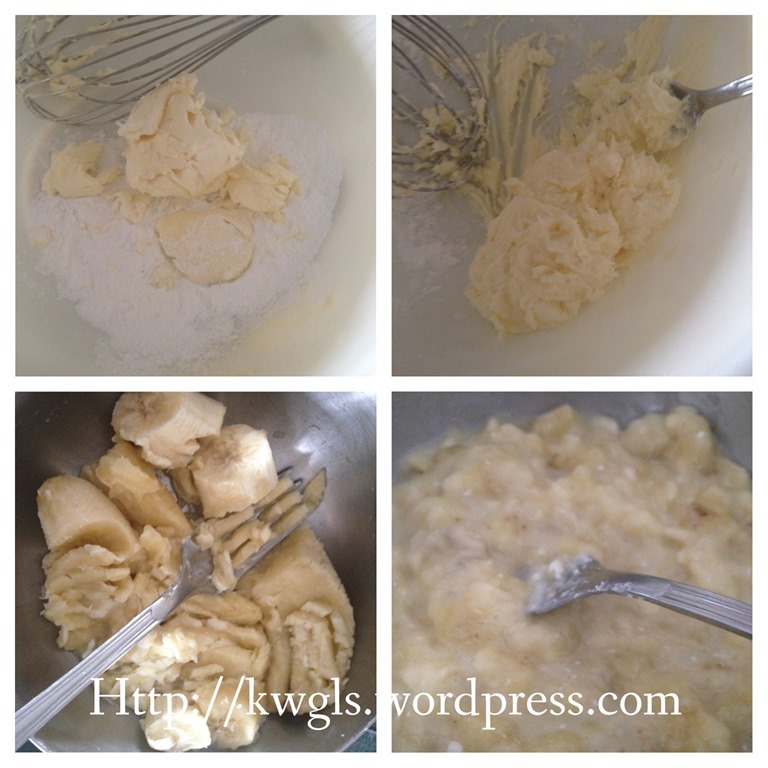 The quantity and types of these raising agent will generally depends on how heavy is the batter… For lighter muffins, I have resorted to the use of self raising flour alone whereas for those batters such as sweet potatoes, banana I will advise to use baking soda too. Put the soften cream cheese in a bowl, add icing sugar, either manually or use a machine to beat it until light and fluffy. Set aside for later use. Put the banana in another bowl, use a fork to mash it until puree form. Add the eggs, milk follow by the melted butter to the mashed banana. Lightly beat until an emulsion is form. Set aside for later use. In another big mixing bowl, sift baking powder, baking soda, brown or castor sugar, plain flour and cinnamon powder or mixed spice. 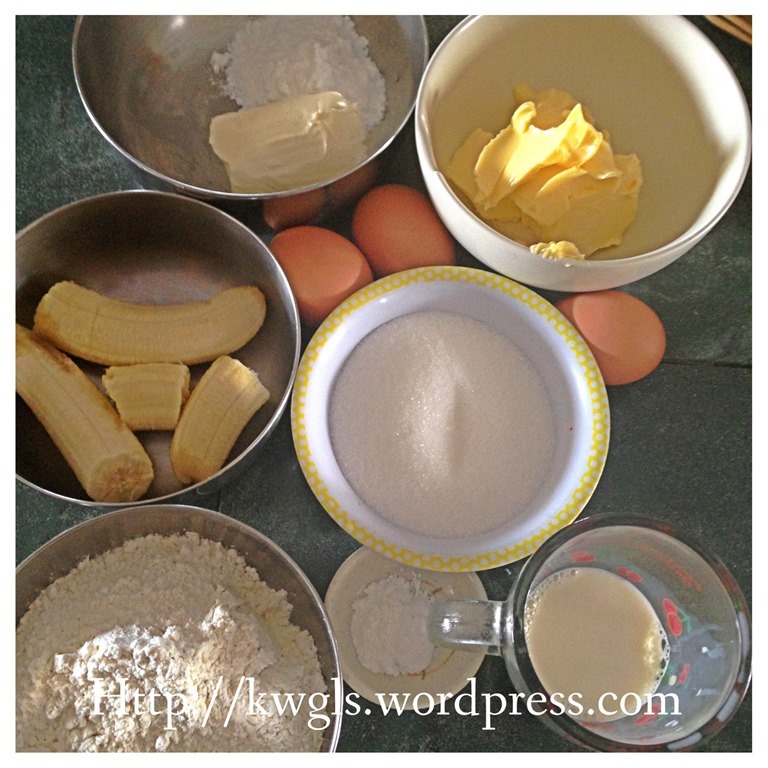 Make a well in the centre, pour the banana egg mixture to the centre of the flour. Use a FORK or SPOON to stir until well mixed. A bit lumpy is acceptable for muffins. Over stirring or mixing will result in chewy muffins as gluten have developed. 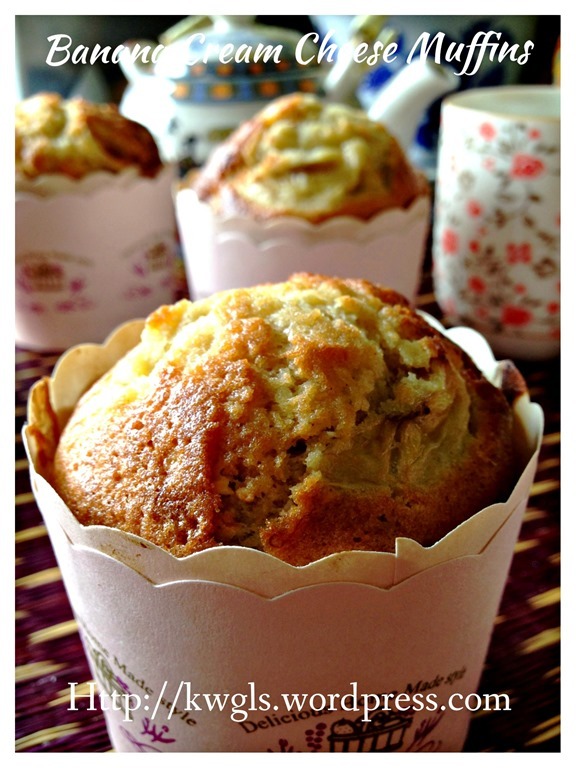 Fill half the muffin cups with the batter. 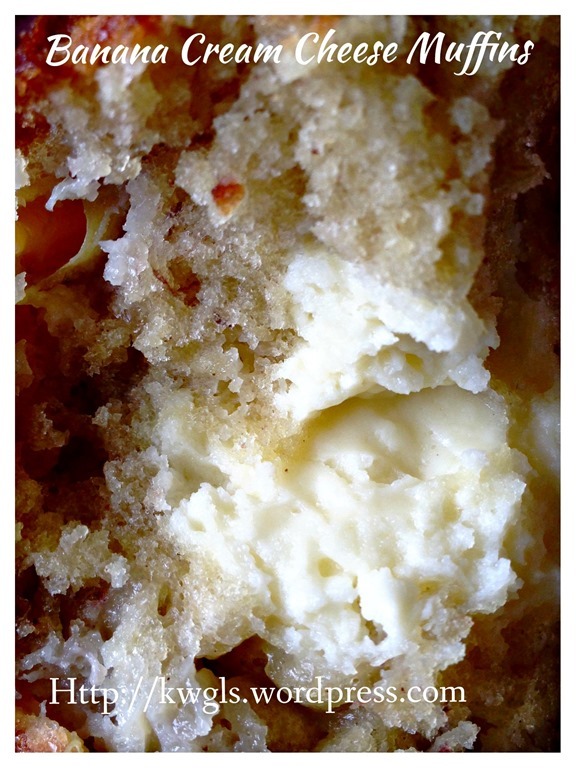 Scope a tablespoon of beaten cream cheese and place on the centre of the muffin batter. Top up the cups to about 80% full with the remaining batter. 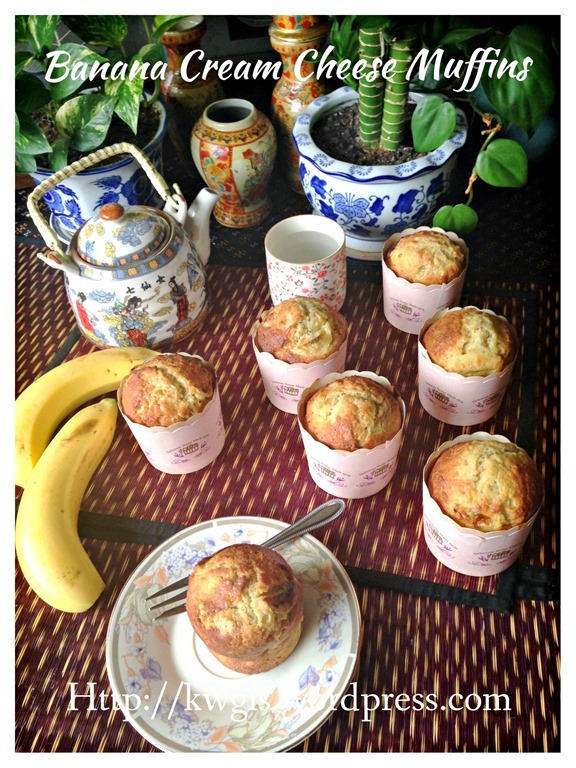 Have some slices of banana on top of the muffin. Bake at the pre-heated oven of 180 degree Celsius for 25-30 minutes or until a skewer inserted comes out clean. Make sure all the batters have cover the cheese and so that there is no chance for the hot cheese to leak out. 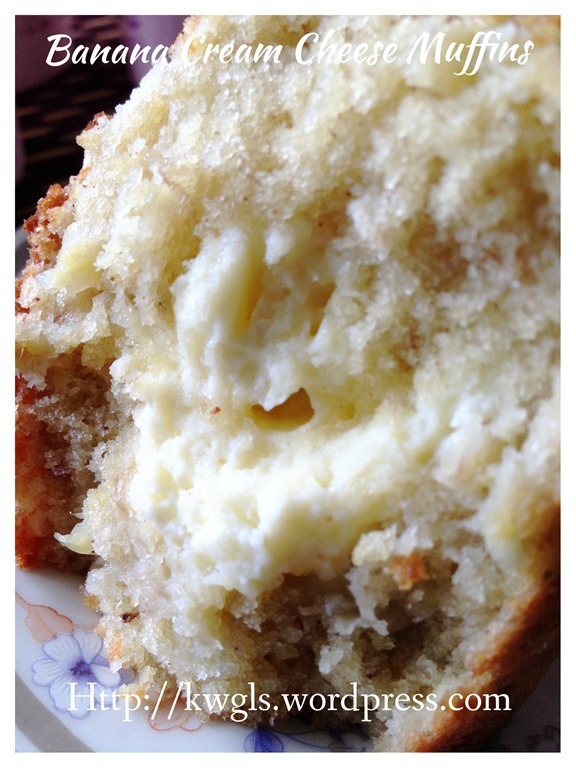 Otherwise, it will resulted in an elephant muffin like this. 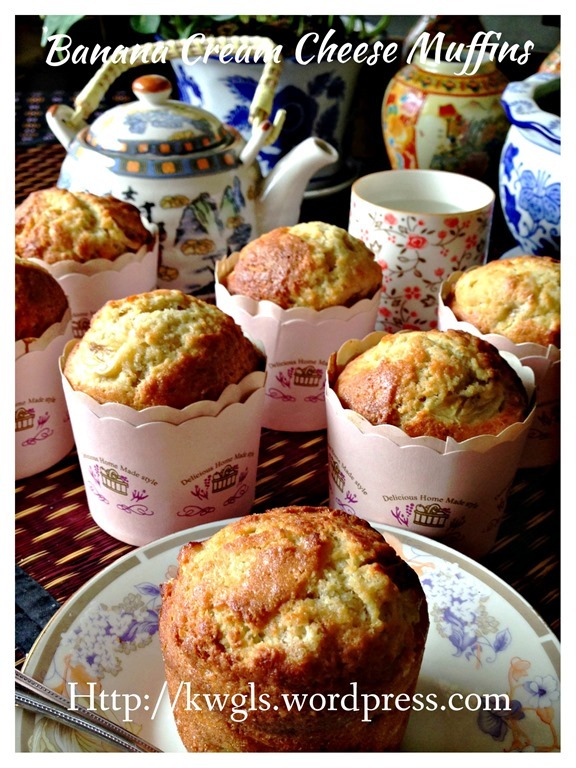 Those readers have tried my old recipe love the muffin very much. Do give it a try if you haven’t. 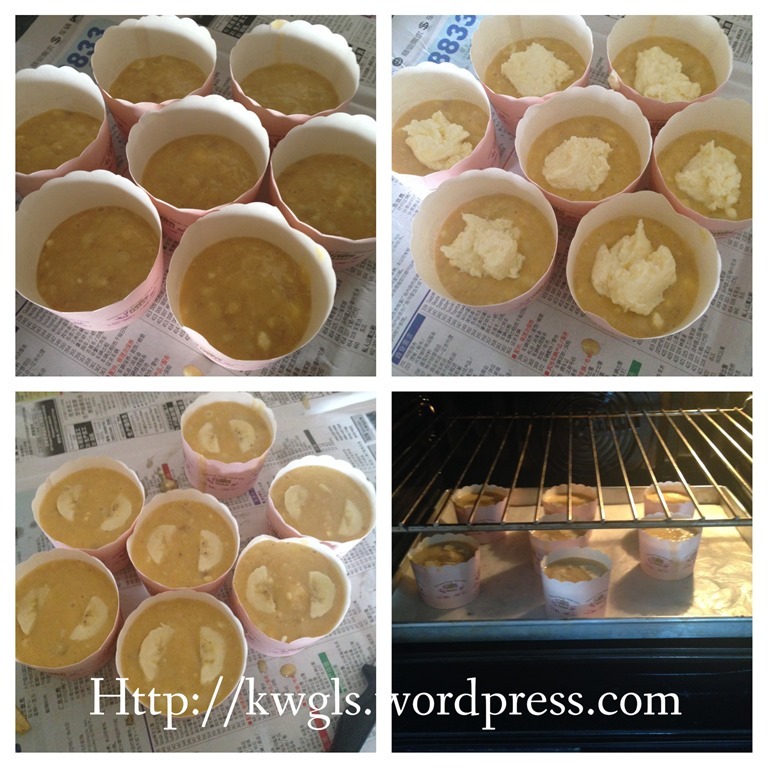 This entry was posted in Cakes and cookies, Food Preparation Series and tagged 8, banana cream cheese muffins, 香蕉奶酪小松饼, GUAI SHU SHU, Guaishushu, kenneth goh, postaday. Bookmark the permalink. Beautiful and healthy muffins made a great breakfast. I loved the cake-like texture which is soft and fluffy. Have a great day. Thank you so much for dropping by. This is the kdis favorite because it is moist and aromatic but some cheesy filling in the centre. I have been following your recipes for quite sometime. I love most of your recipes because they all look delicious to me.Thank you for sharing your recipes. And, i like your description and the procedures especially those nice pictures. Just love it! 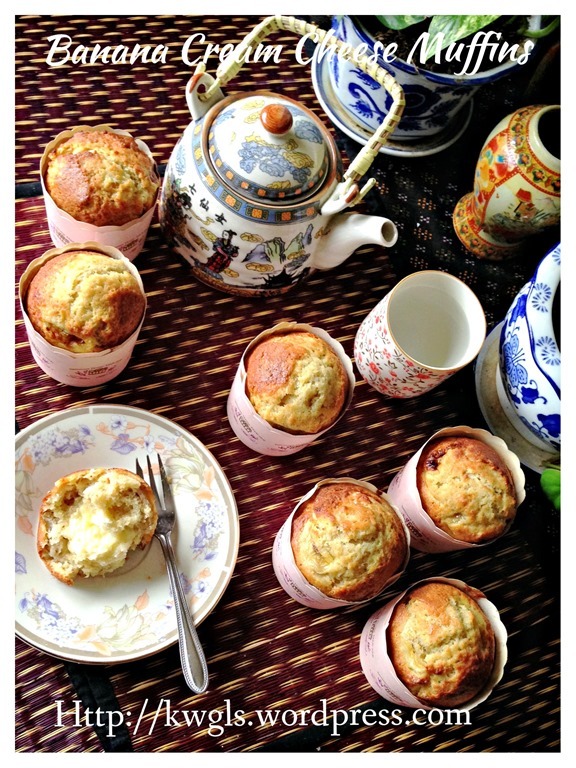 I tried baking theses banana cream cheese muffins but realised the milk and brown sugar missing in yr steps. I added in after eggs, hope this is correct steps. It was a success n tasted yummilicous. Soft and nice combi with cream cheese. 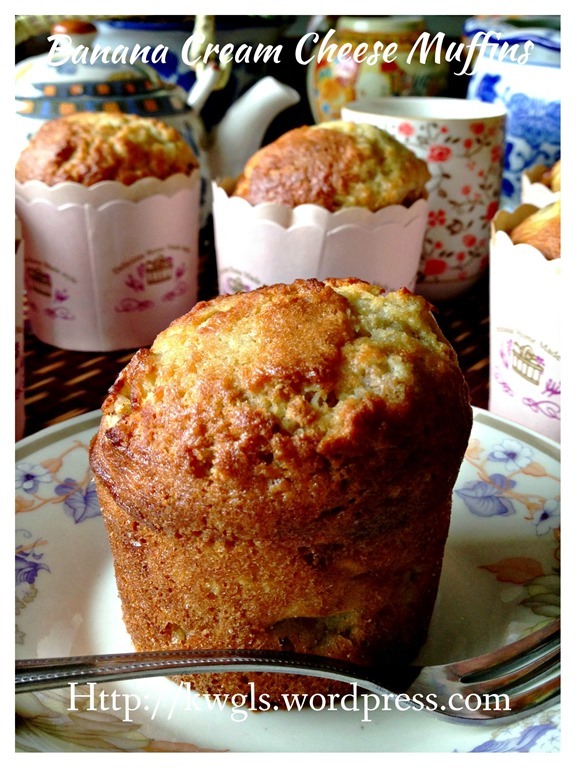 Just pinned these delicious muffins and will be sharing on FB later today!! I can replace plain flour to cake flour? If I am using self rising flour, means i do not need baking powder right? Then, is baking soda and cinnamon mix a must? Could you pls kindly advise me why i try your muffin recipes (carrot and banana cream cheese), it always flat, never domed on top although i follow bery carefully step by step, both temp and fill only 3/4 cup of muffins. 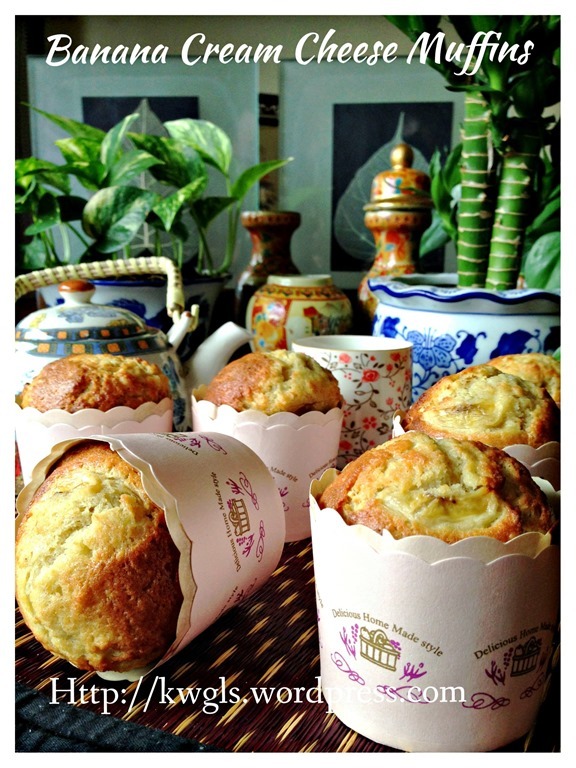 I use paper cup of muffins. Seem i so disappointed with my muffins that never get domed on top, flat flat and falt ;(. Pls kindly help. Thanks and appreciated!